Many Christendom alumni have graduated with a liberal arts degree and found success in the STEM fields. Philosophy major Catherine McFadden and theology major Angelica Cintorino are registered nurses. History major John Paul Jansen and philosophy major John English are now physicians. Philosophy majors Bennett Ellis and Tim Lanahan are software developers. The list goes on. Now, thanks to several additions to the college’s science curriculum, Christendom’s already robust curriculum offers new, foundational science classes which will be very beneficial to those interested in entering the medical or scientific fields post-graduation. STEM careers are particularly appealing today, and about 10% of Christendom graduates aspire to enter these areas of work. By offering science courses that can help meet prerequisites for such fields, the college makes it possible to attain practical skills while still receiving the time-tested liberal arts education. The college’s extensive 86-credit-hour core curriculum already requires each students to take one semester of both a math and science course at a minimum, but now, in conjunction with the math major’s extensive offerings in upper level mathematics courses, students can take courses in biology, physics, anatomy and physiology, among others. Students in the three levels of physics classes not only cover material on Newton’s laws of motion, electricity, and special relativity but also take labs for each course. In the new science lab constructed in the lower level of St. Columba residence hall, students conduct experiments to put into practice the physics discussed in the classroom. These labs also give students the opportunity to gain experience in data acquisition and analysis. These classes can be put toward Christendom’s physics minor, which requires 18-credit-hours of 200-level or above physics courses. This challenging minor also requires the completion of Calculus I, which forms an integral part of the foundation for the study of physics. 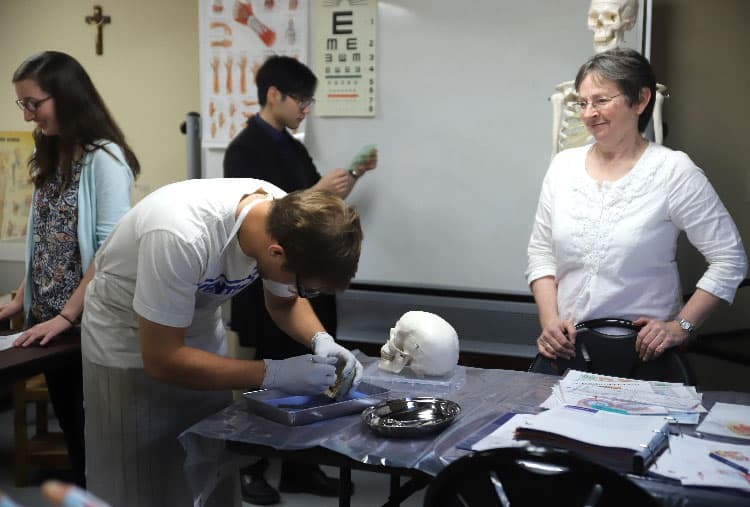 Dr. Aileen Foeckler teaches the biology and anatomy and physiology courses at Christendom, bringing years of expertise to the classroom. Her classes also utilize the new lab for animal dissections and other experiments. These hands-on courses allow students the opportunity to earn important credits necessary if they wish to pursue science degrees later. “The expansion of the sciences is a benefit for those who want to go into the medical field especially. Those looking to become doctors or nurses can now get their prerequisites out of the way early here on campus,” says Townsend. Students have found great success in STEM careers after graduation, becoming doctors, nurses, surgeons, engineers, and more. Christendom’s advancements in the natural science department provide a great way for students to begin working science into their well-rounded curriculum, preparing them to find similar success in their careers after graduation.